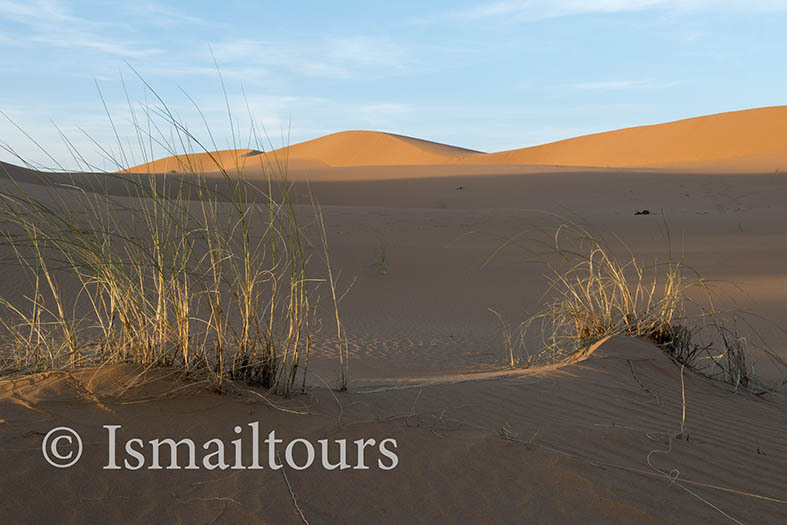 Ismailtours is organizing in cooperation with photographer/ teacher Sabine Joosten amazing photo journeys /courses for beginners and advanced photographers through the Sahara desert in Morocco or to other beautiful spots in Morocco. Date ; everything is possible! 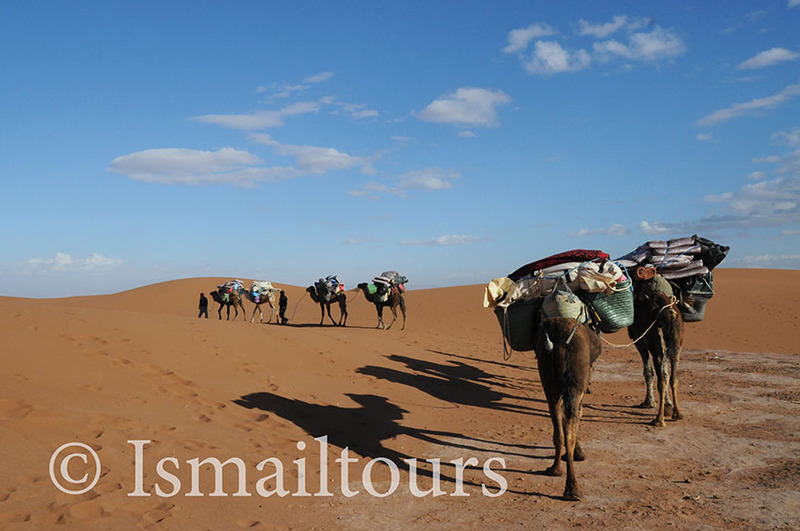 A unique chance to travel with Ismailtours on a well organized trip through photogenic Morocco. 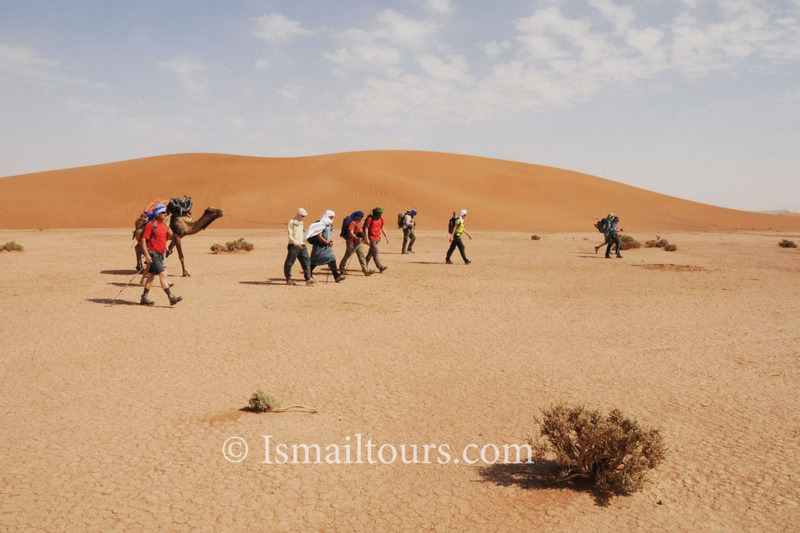 You will travel for 10 days from Marrakech through Ouarzazate to the Cheguaga (Sahara) desert and will be walking for 6 days accompanied by a professional guide, while dromedaries carry your luggage. We travel slowly, so there will be enough time to enjoy the surroundings, the country, and of course to take pictures. Should you prefer to travel without a camera; this is of course also possible. Also other spots in Morocco. 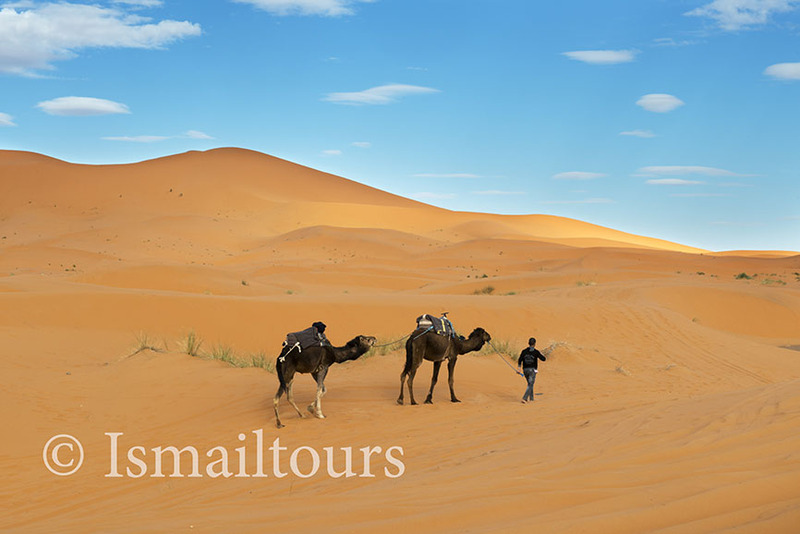 Create a group of at least 6 persons and let Ismailtours organise your trip. By means of a structured course, you will gain a large amount of information about photography. We will start with the basics and expand on different topics, adapted to your individual preferences and the wishes of the participants. There will be plenty of time to develop your own visual language. Sabine Joosten, a professional photographer with a large amount of practical- and learning experience under her belt, will be assisting you. 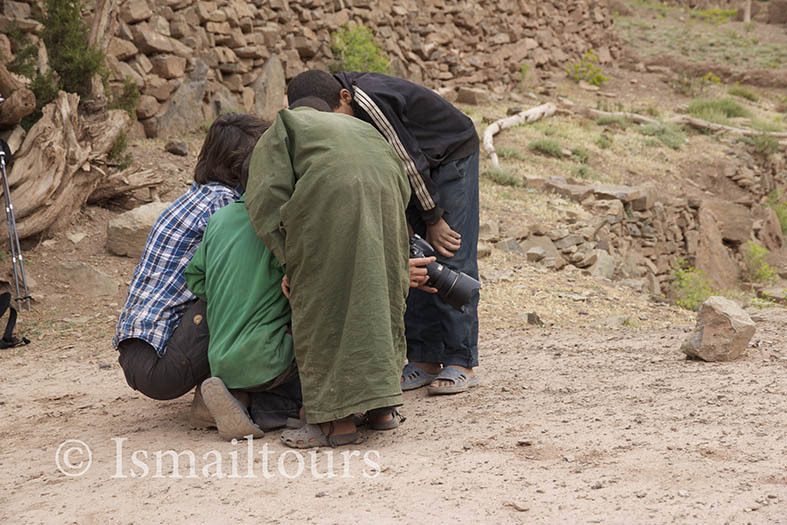 It’s great to share ideas and insight about photography with your fellow travellers and an experienced photographer. Every day you’ll be able to apply the skills you’ve learned and all your questions will be answered. Together, we will look and analyse photographs of others and ourselves. You’ll learn how to see differently and also how to analyse your own photographs. You may make your own decisions and develop your own methods. There will be also lessons on your own work flow; how do you select your images, how to digitally label your photographs so you can find them afterwards! A camera is an extension of yourself, of your thoughts, your feelings, your way of looking at your surroundings and the world around you. And how to capture all of it in a single photo. You will gain a lot of experience, dare to think differently and to look with an open mind at the world around you. Together with a group who share the same passion in a beautiful country, this way of traveling and learning is an unique opportunity. We begin our trip in Marrakech, one of the most beautiful King cities of Morocco. 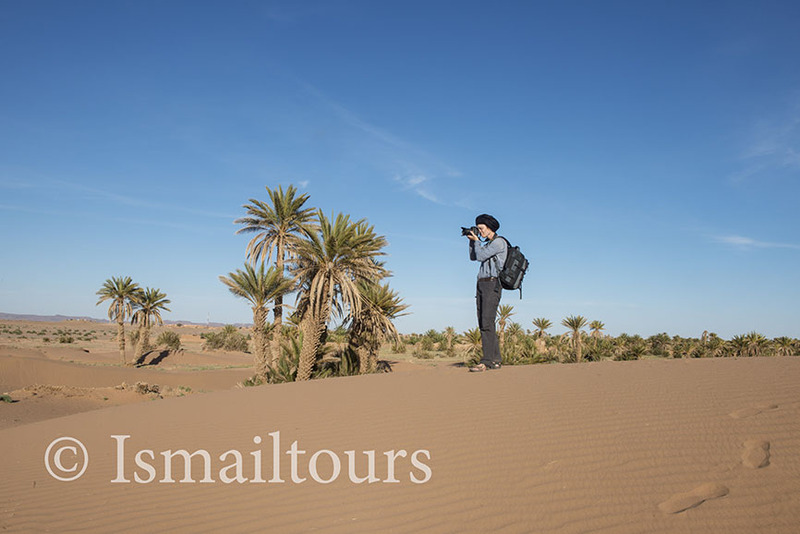 You will be picked up at the airport by our guide Ismail, he will guide you to your beautiful traditional Riad (traditional Maroccain house), where you’ll have your first lesson and will discover the Medina as well as the central square; the Djemaa el Fna. 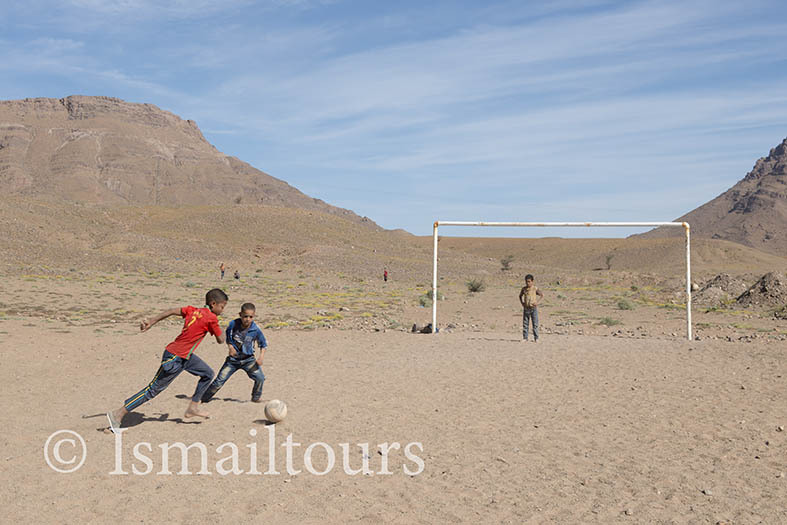 The day after we will leave the city by a minibus or 4×4 cars to Ouarzazate, a small town, where we will stay for one night, or in Tamdagte a nearby village. The next day we’ll stop at photographic and culturally interesting locations. 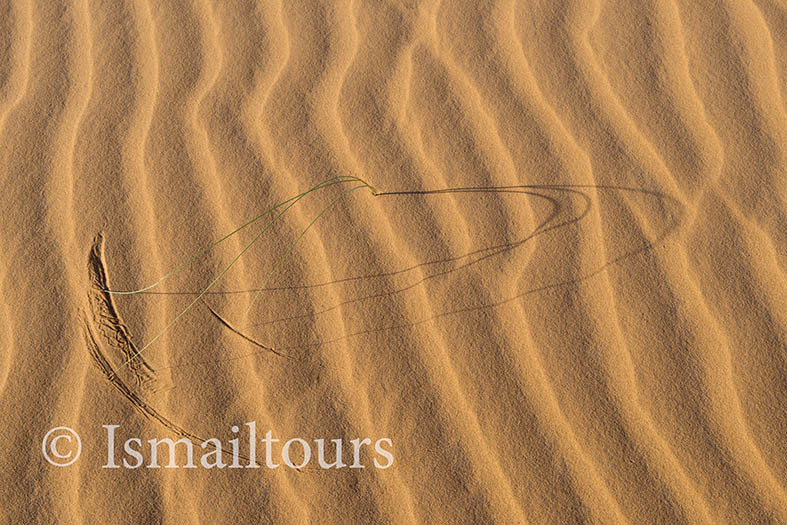 We will reach our goal, the start of the desert where we’ll meet our staff and dromedaries. 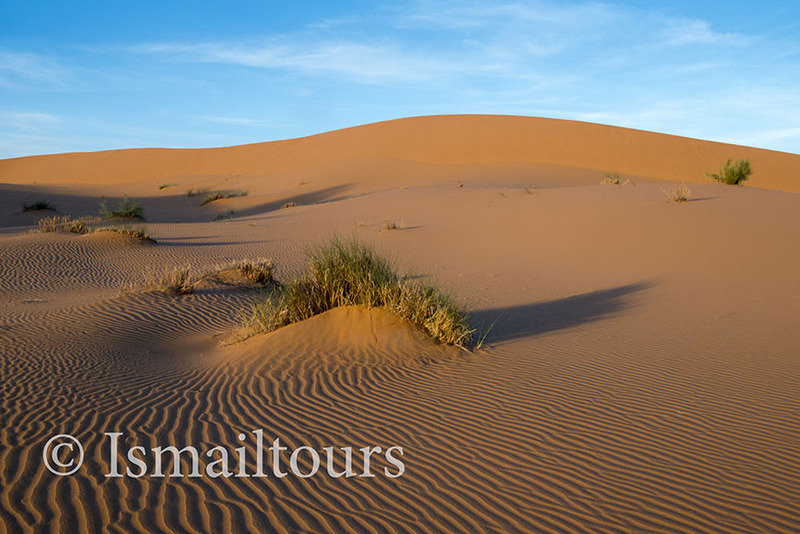 The Sahara desert is situated behind the last mountains of the anti-Atlas Mountains. We’ll cross another part of this area each day with changing landscapes, colours, vegetation, structures and levels at every turn. It is as if you are walking through a movie scene. We’ll sleep in tents in 6 different spots in the desert. Our cook will prepare various tasty dishes. We will walk a maximum of 25 kilometres a day, a moderate distance even for novice hikers. If you are too tired or you wish to have a higher point for taking photos; you are welcome to sit on the back of a dromedary. Camping in the desert far away from the civilised world, is a unique experience. At this time of the year the temperature reaches a maximum of 30 degrees and in the night it can be as cool as 8 degrees. The daily walking, the serenity and emptiness while the rhythm of the day is decided by the sun and the sunset is extraordinary. 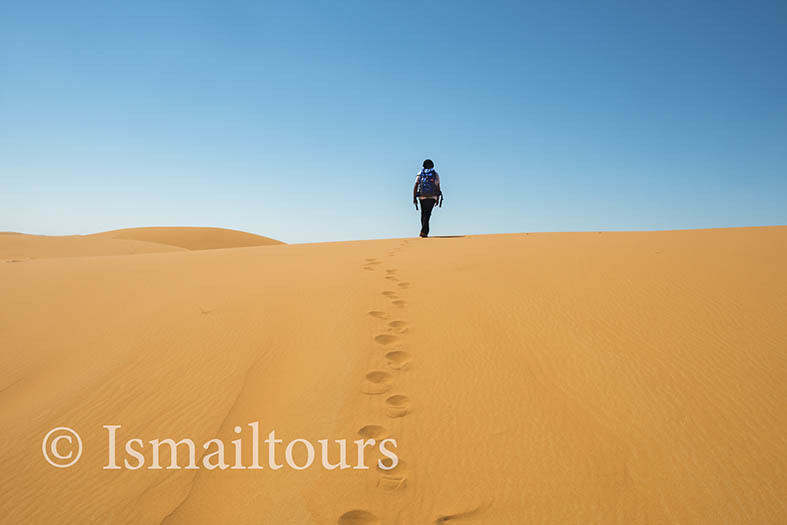 Together with professional and trusty guide and staff you won’t have to worry about where to go, what to eat and which spot will be the best for your tent. 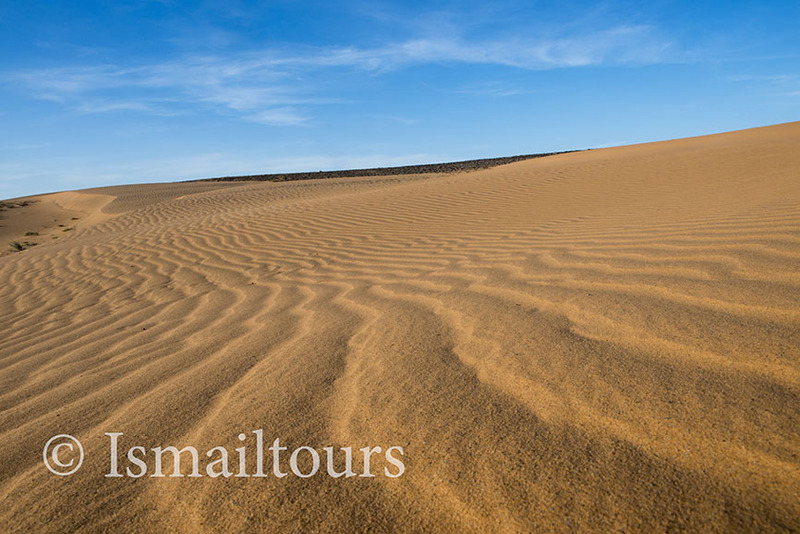 The huge sand surroundings, pure nature, will give you the opportunity to enjoy, to let your thoughts flow, to discover and to take the most beautiful photographs you ever taken. 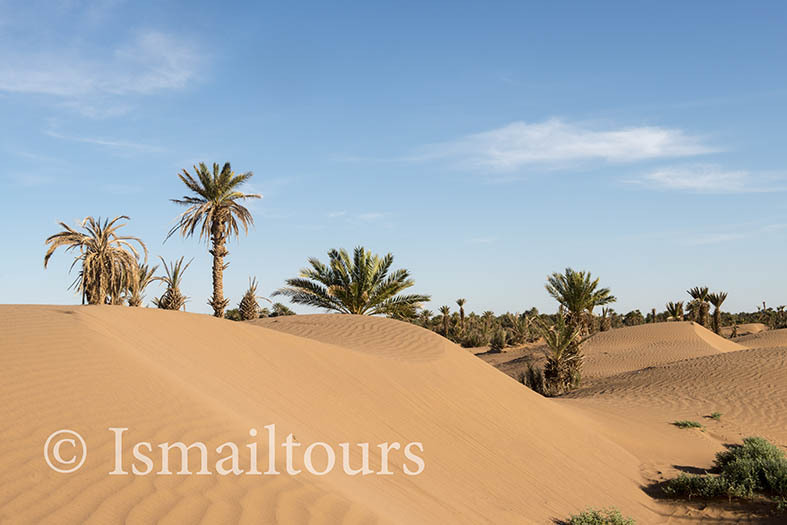 Day 1: Arrival in Marrakech –Transfer to your Riad. 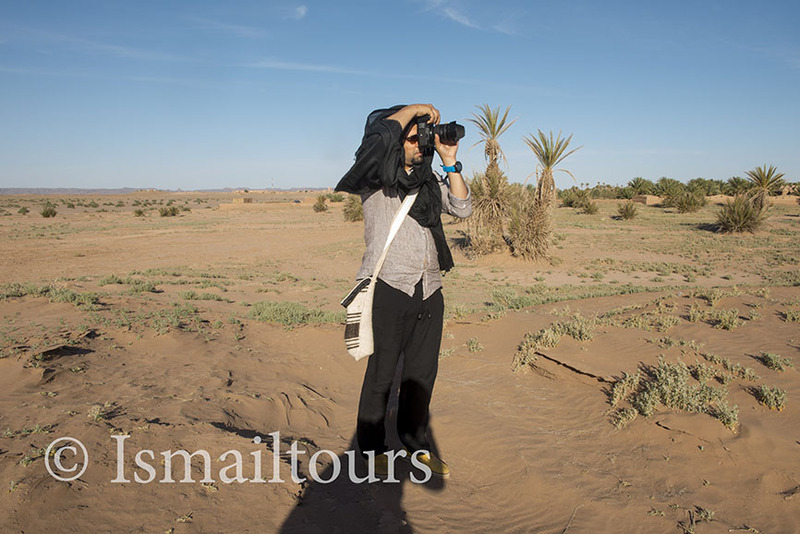 At the airport of Marrakech your guides, Ismail Zegzaou and photographer Sabine Joosten will be waiting. Together you will travel to your accommodation by minibus. 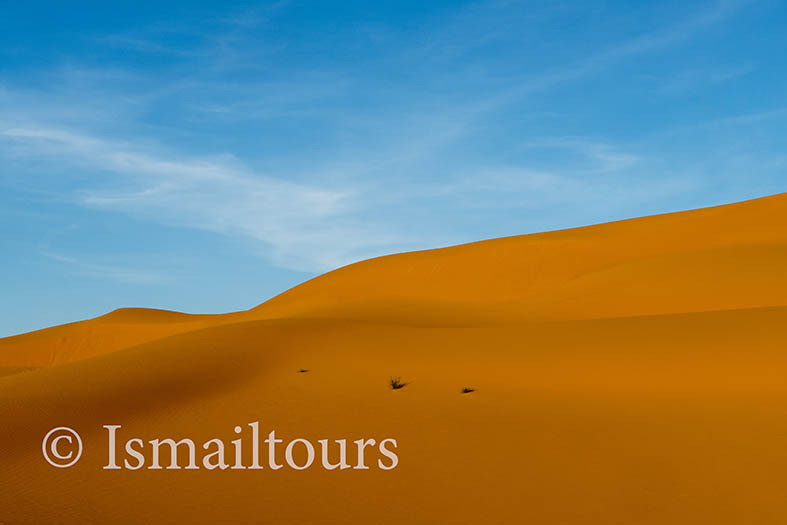 You will stay in a homely Riad situated in the centre of the old Medina of Marrakech. Every room has its own bathroom including shower and the rooms are decorated traditionally and colourfully. After seeing you rooms there will be an opportunity to get to know your guides and fellow travellers. 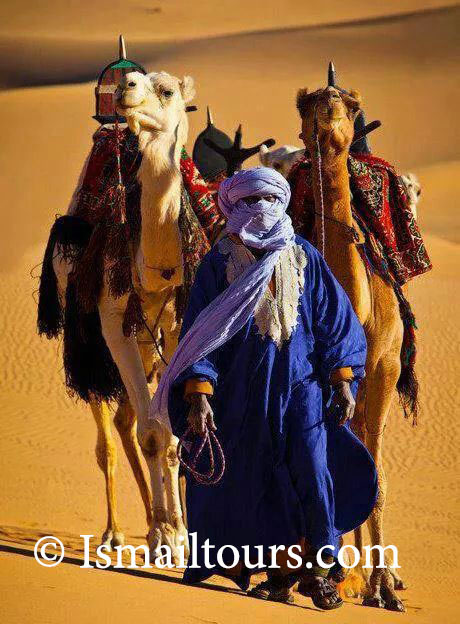 We will depart together for the city square, the Jemaa el Fna. Photography here is an experience of a lifetime. 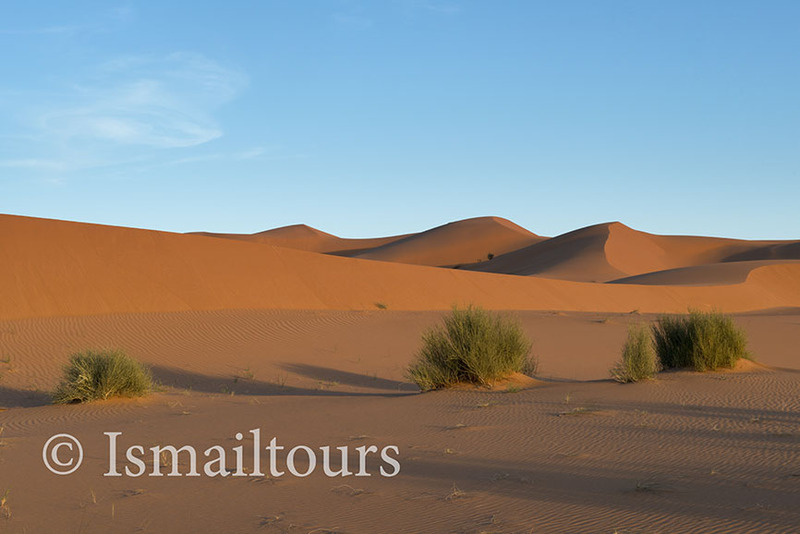 We will dine together in the Riad or in a local restaurant and you will have time to relax and process your first impressions of Morocco. Overnight: Riad, similar to bed and breakfast. 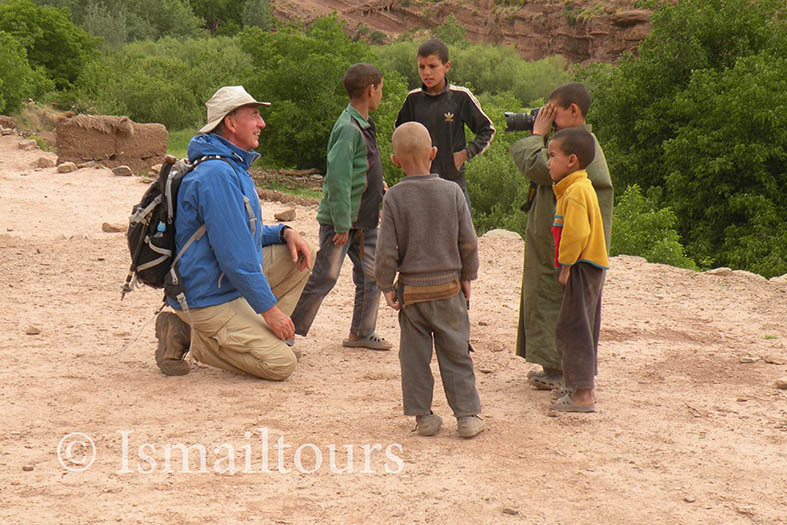 After breakfast we will leave the bustling city behind us and depart by minibus or 4×4 towards Ouarzazate, a small city. We will travel over the Tizi ‘n Tichka pass to the south. The highest point, is at an altitude of 2260m. 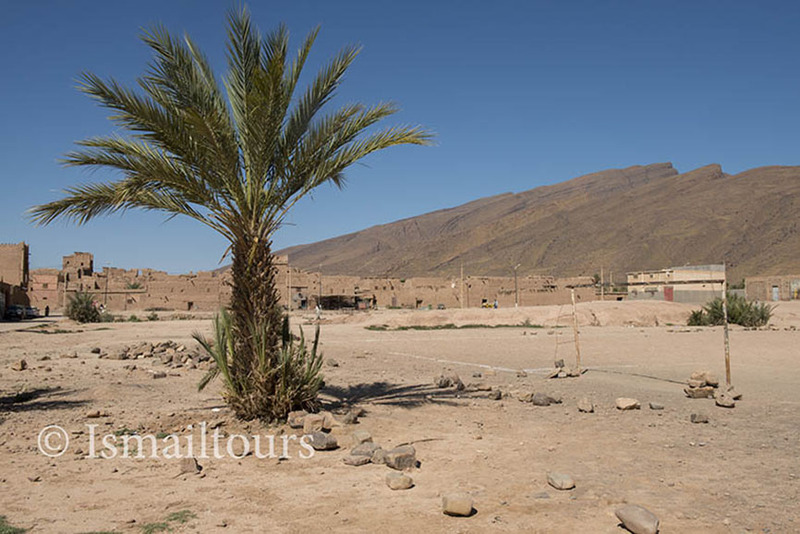 The road travels straight through the Atlas mountains and offers amazing views of the mountains and valleys. 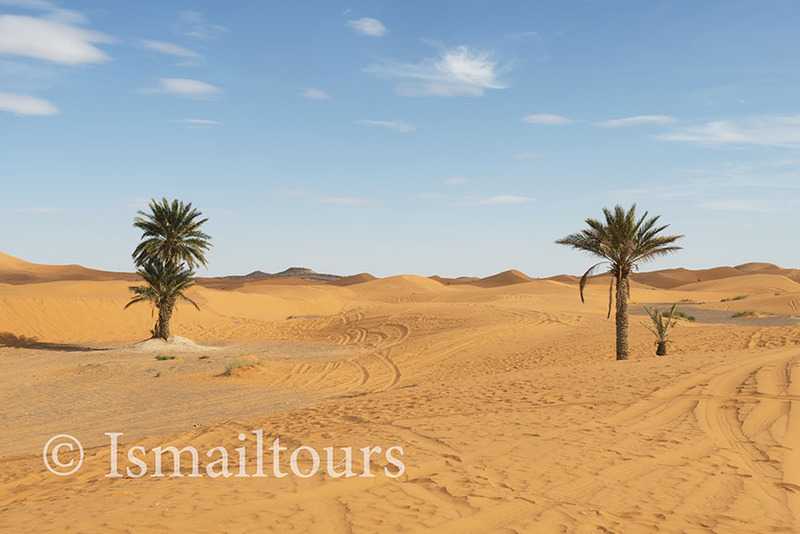 On the road, we will visit the Kasba of Talouet and pass, and stop at, numerous small villages. We will have lunch with the locals, or at a local restaurant. South of the pass, lies the Ait Ben Haddou, a spectacular kashba. 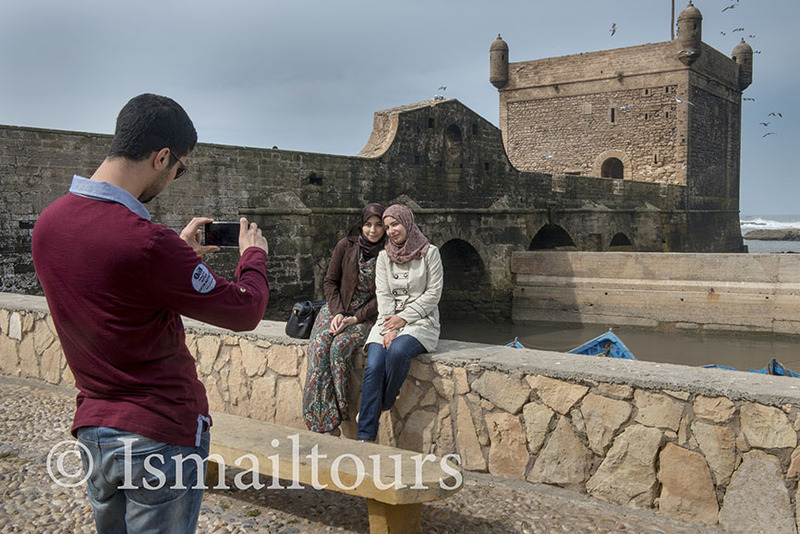 We will explore the kashba complex and climb to the Agadir (fortified granary), where you will experience wonderful views over the valley. This is a protected UNESCO site. There are many streets and spots to wander and take beautiful images. 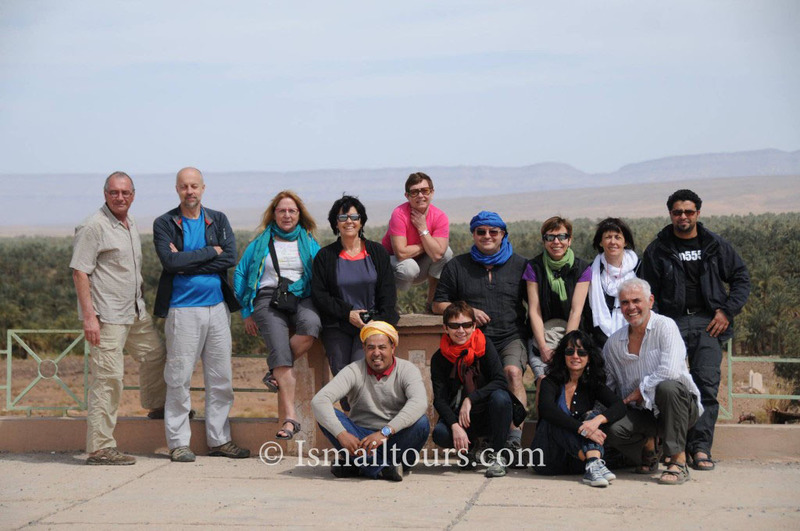 Afterwards, we will drive to our hotel in Ouarzazate or a riad in Tamdagte where we will spend the night. We will have dinner together at the riad or at a local restaurant. Overnight: Riad or hotel, similar to bed and breakfast. We resume our journey after breakfast and head south. 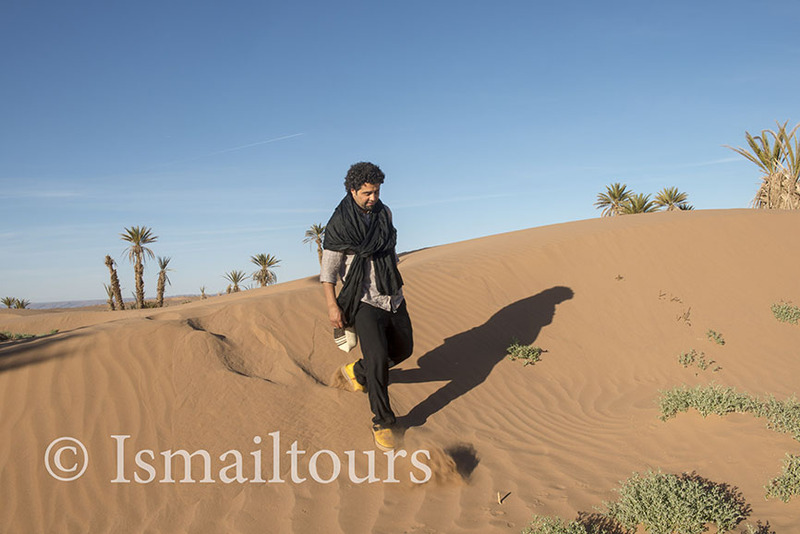 The trip takes us through the stunning valleys of the Draa, a large Moroccan river that originates from the Atlas mountains. 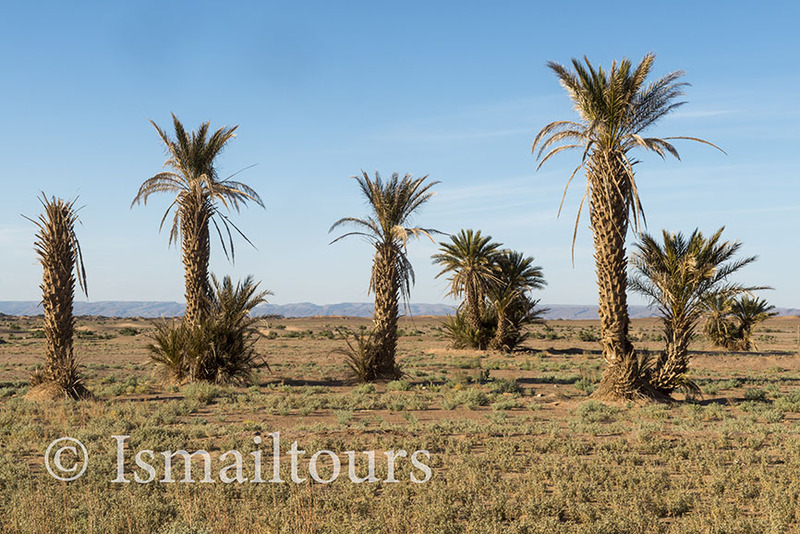 We will see beautiful kashba’s and drive through vast areas with many date palms. 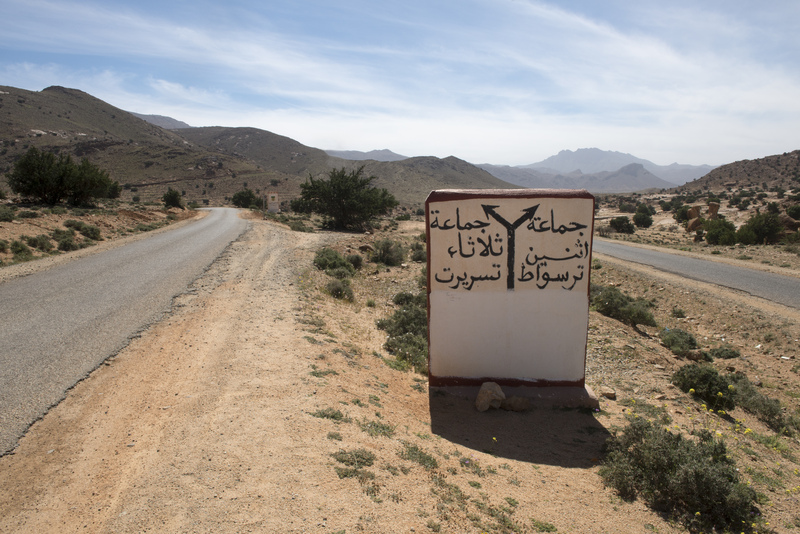 We will pass Agdz, Zagora, Tagounit, Oulad Driss and drive for approximately 265km. We will make a few stops of course to take photographs. 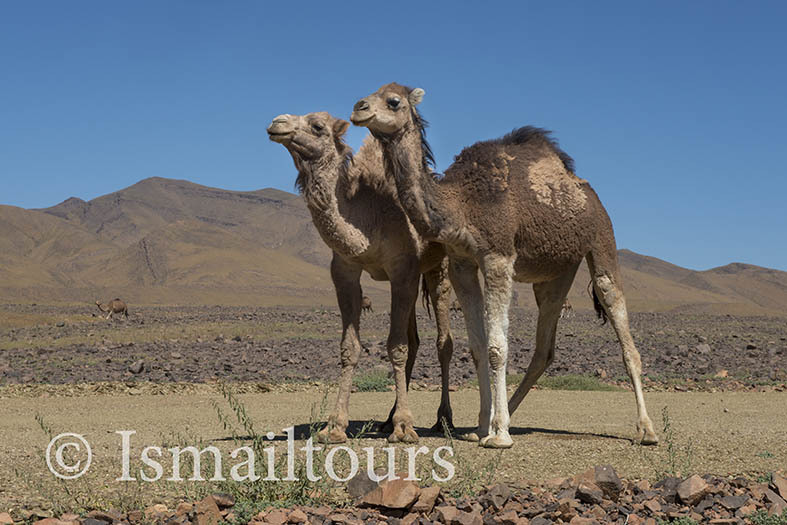 Finally we will reach Mhamid, where we are expected by our Moroccan cook, the dromedary drivers and of course the dromedaries that will carry our luggage, and can carry us in the event of fatigue, injury, or if simply a high viewpoint is required. After the animals have been loaded, we will take a short walk. 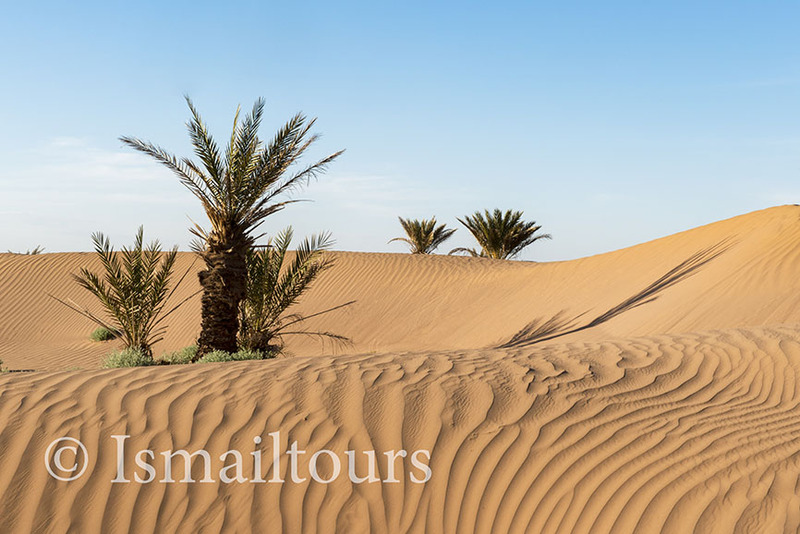 We will cross the Oued (dry riverbed) of the Draa and walk to the end of the palm gardens (the Ras Nkhel), where we will set up our first camp. The camp consists of a large tent which can be used for dinners depending on the weather, tables and chairs, and small tents to spend the night in. The mattresses we sleep on are comfortably thick. If there is time over, it may be possible to take a short walk and take photographs in the area. The civilized world is still accessible. Finally, we will share a delicious, healthy meal prepared by our cook and spend our first night in the desert. On this day, we will spend just under an hour walking through the start of the desert. After breakfast, we depart the fertile area watered by irrigation systems and hike through a forest of tamarind trees along the small river Elmaleh. 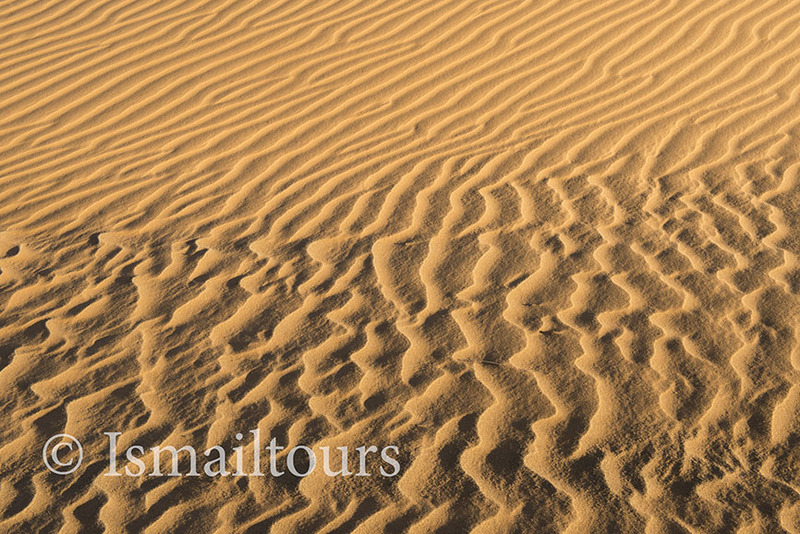 In the rhythm of the dromedaries and ever changing landscapes is photography a much different experience than in the busy city. 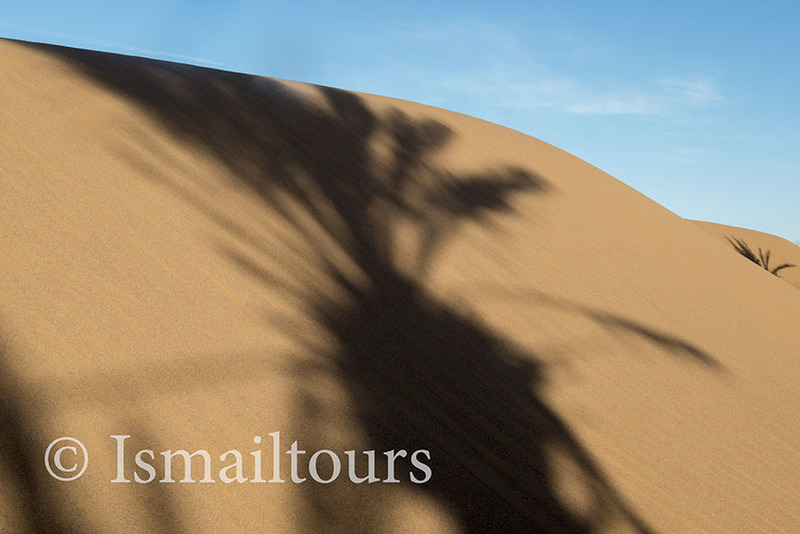 You could leave your camera in your bag for a day if you wish, or maybe you immediately spot the best dune or palm tree, or you choose to sit on the back of one of the dromedaries for a better view; it’s all possible. We are going to discover and experience it all. 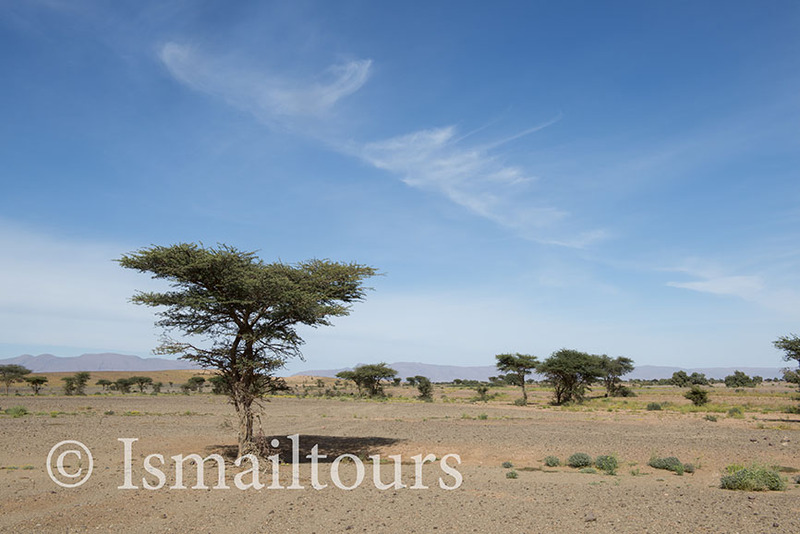 We continue our trek, crossing the plateau of the Sidi Naji and set up camp, not far from the Marabout (wise man) of Sidi Naji. Walking time approximately 4 hours. After a delicious breakfast we will depart and leave the Tamarind forest to slowly but surely arrive in the immensely vast desert. We will walk west, deeper into the desert. The tamarind trees disappear slowly. 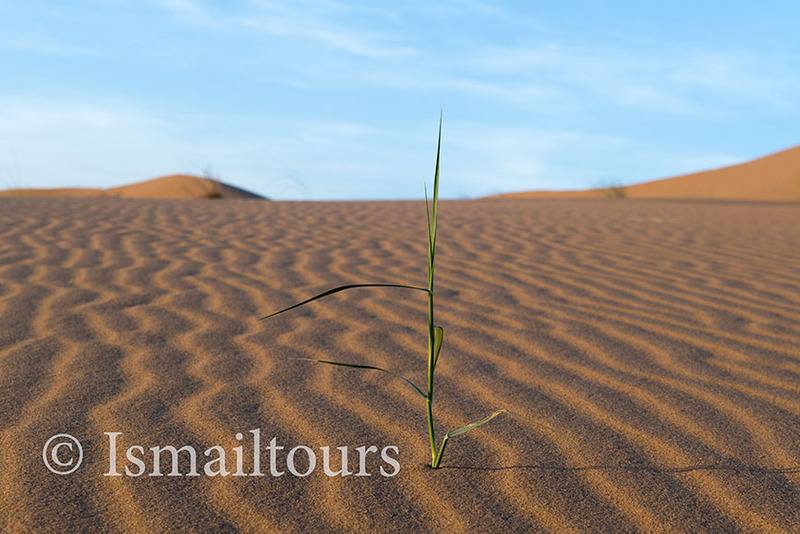 The high dunes fill the landscape and after a 5 hour walk we will reach the erg (dune sea) of Zaher, our camping spot. We will enjoy the sunset and a delicious meal. After breakfast, we continue north and then west. 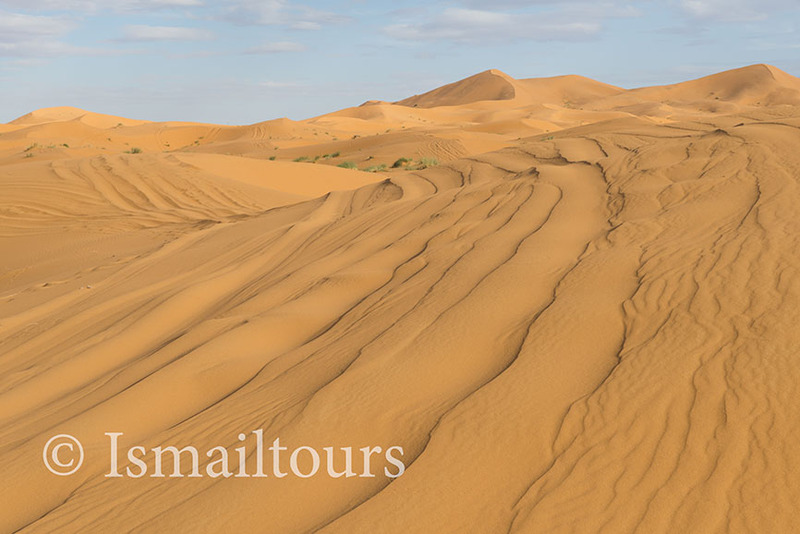 We will cross dry riverbeds of the Draa, an expanse of sand and rocks and pass a small village, El Bloc. 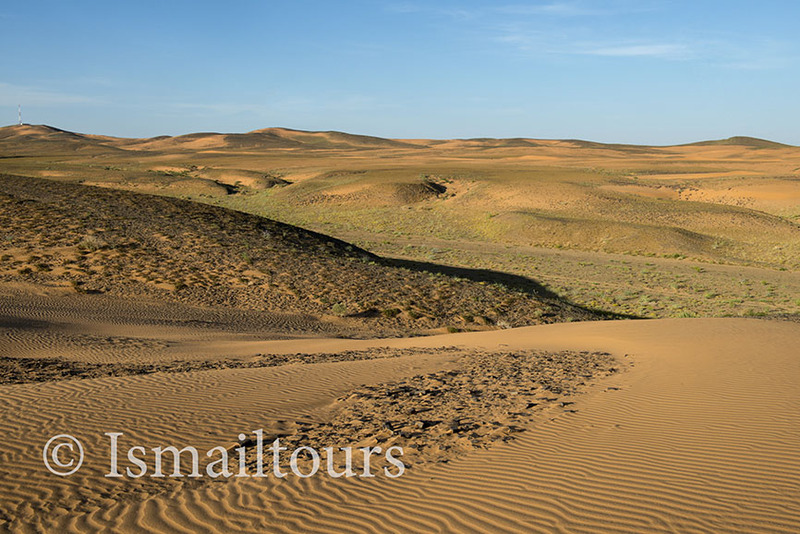 Here you can see traces of an old irrigation system and abandoned ruins where people lived and nomads sometimes inhabit. Here we will of course take our time to photograph the area. Nearby we will set up camp. On this day, we will walk for approximately 3 hours. 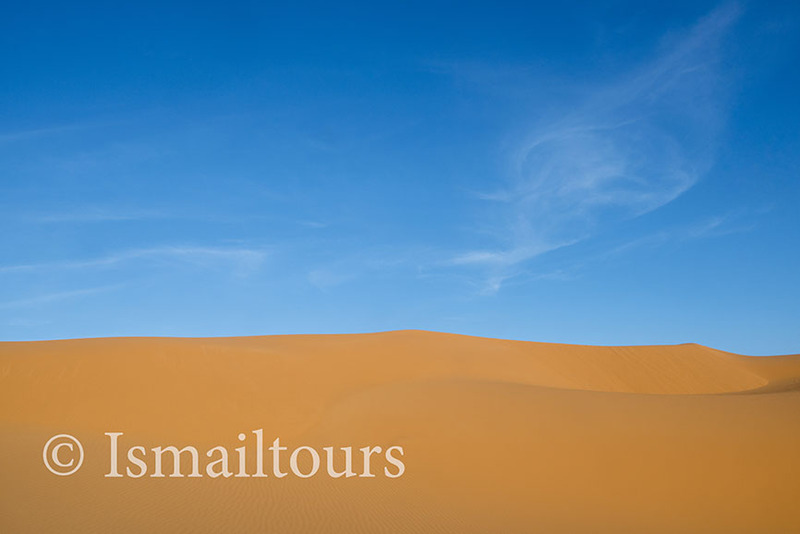 We are now in the heart of the great Sahara, surrounding us there are dunes and expanses of sand as far as the eye can see. 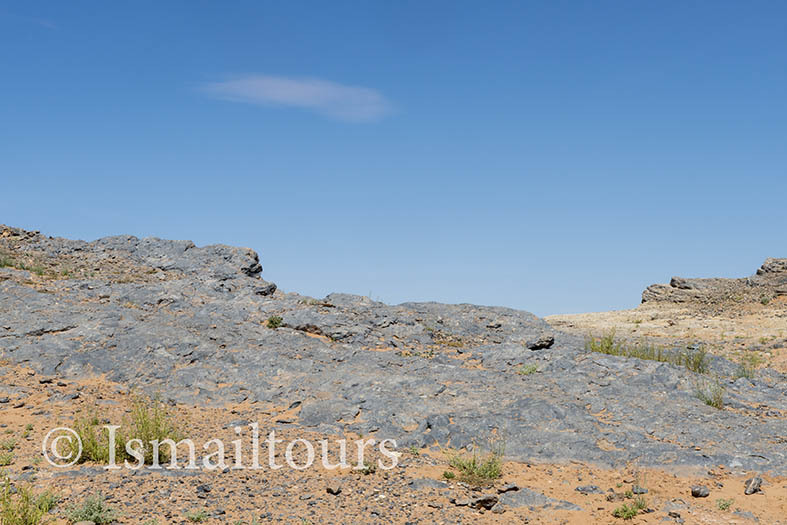 The Hamada (rocky plateau in a desert area) of the Draa and the Jbel (mountain) Bani can be seen on the horizon of the landscape. You will be amazed by the many colours. 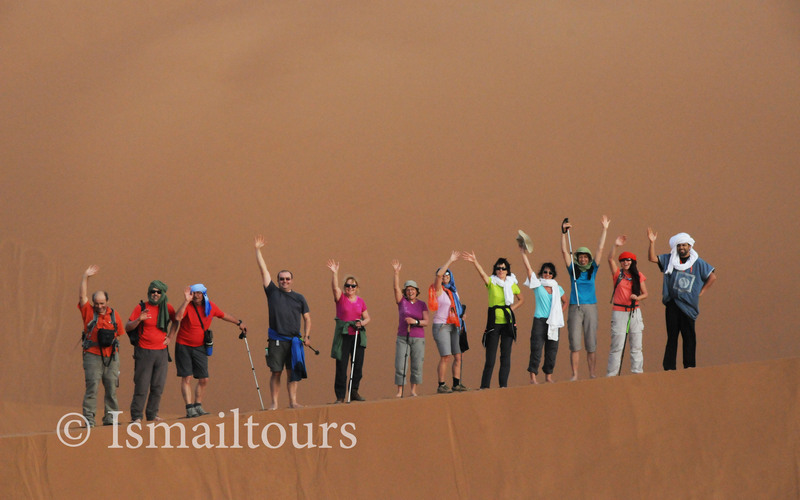 At the end of the afternoon, we will climb the highest dune, named Abidlia, to enjoy the sunset. We will make camp on the dunes of Sedratte. On this day we will walk for approximately 3 hours. 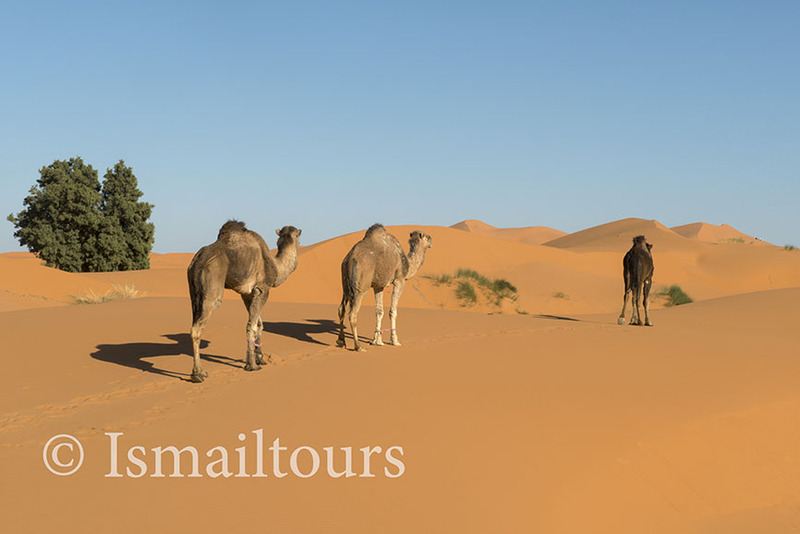 In the slow rhythm of the dromedaries we will leave the dunes of Cheguaga. 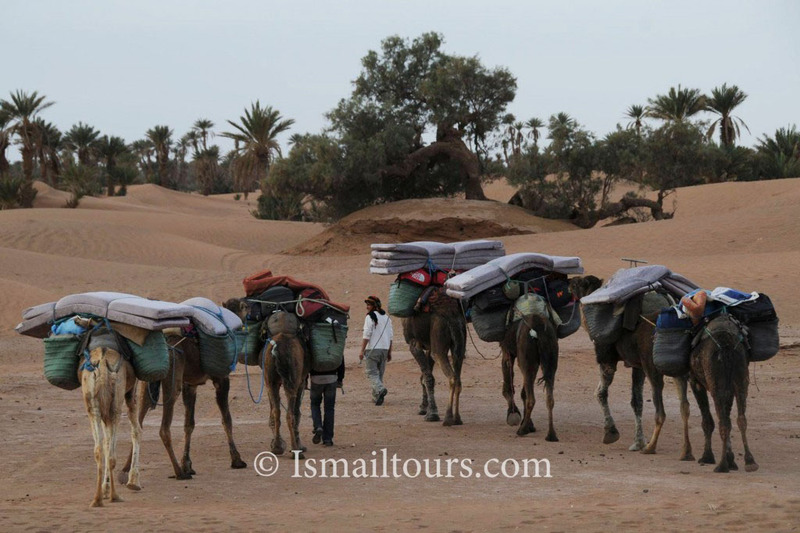 During the hike we may meet nomads, who stay here in tents. We will cross a dried lake, the Daya de Cheguaga. 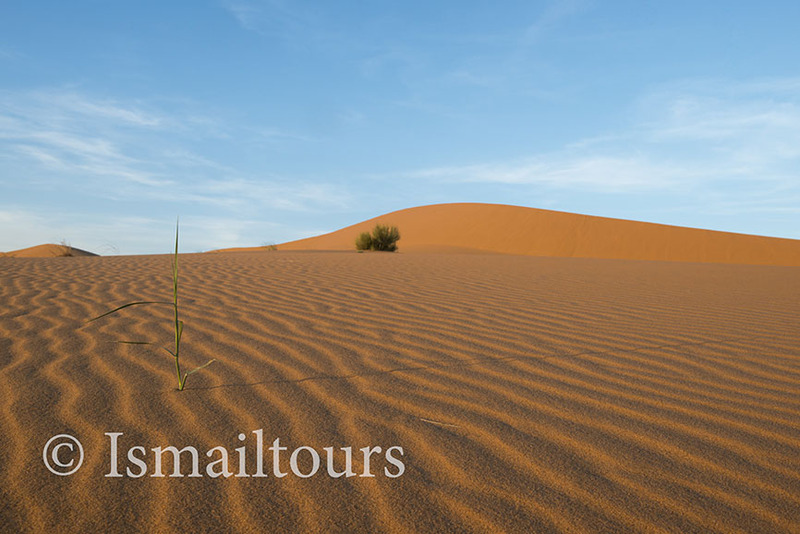 Here we will set up our camp for the last time in the centre of the dunes. 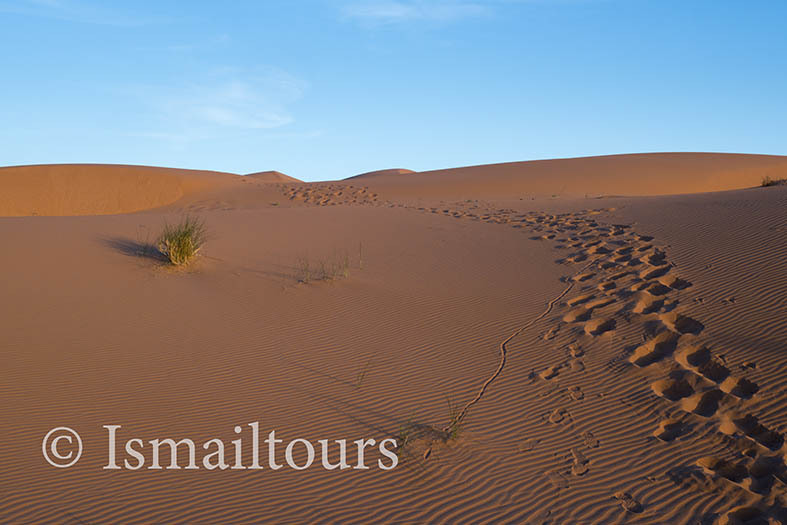 Those who wish to, can climb the highest dune to enjoy the surroundings and the sunset. On this day we will walk for approximately 5 hours. After breakfast, transport will be waiting to bring us back to Marrakech. We will say our goodbyes to the animals, their drivers and the cook. During the trip will come across beautiful landscapes, at which we will stop regularly. We will also stop to have lunch. Back in Marrakech we will be taken to our Riad. In the evening, we will browse the photos we have taken. Back in the civilized world at last! Those who wish to, can take photos in the city. Marrakesh is very photogenic city, also in the evening with no sunlight. 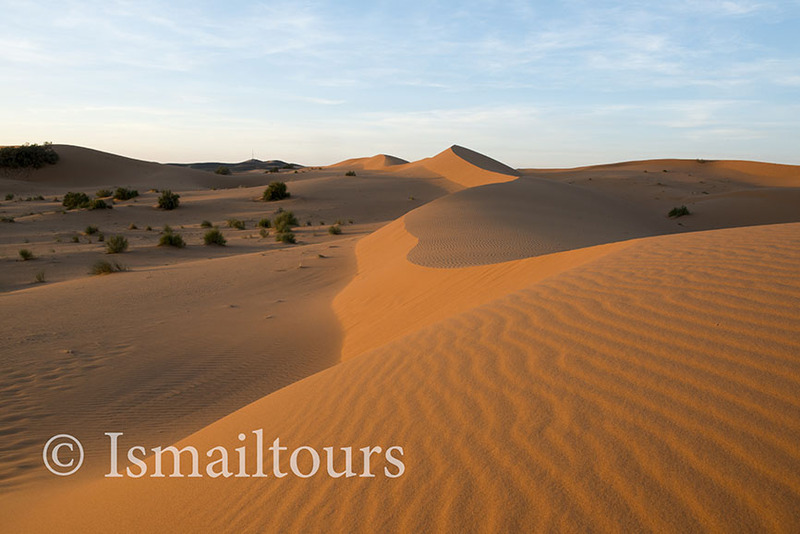 You will be picked up on time by our guide, Ismail and brought to the airport of Marrakesh for your return flight. We wave you goodbye at the airport and hope that you have enjoyed your time in this spectacular country. We are also certain you will be happy with the photos you have taken, the skills you have learned and the stories you have to tell back home. 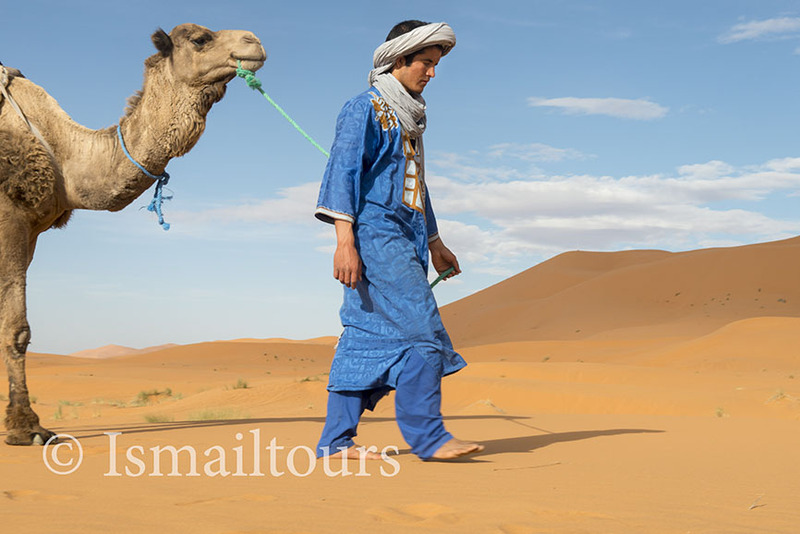 Moroccan native Ismail Zegzaou is a travel guide with broad knowledge of Morocco, its people, traditions and culture. 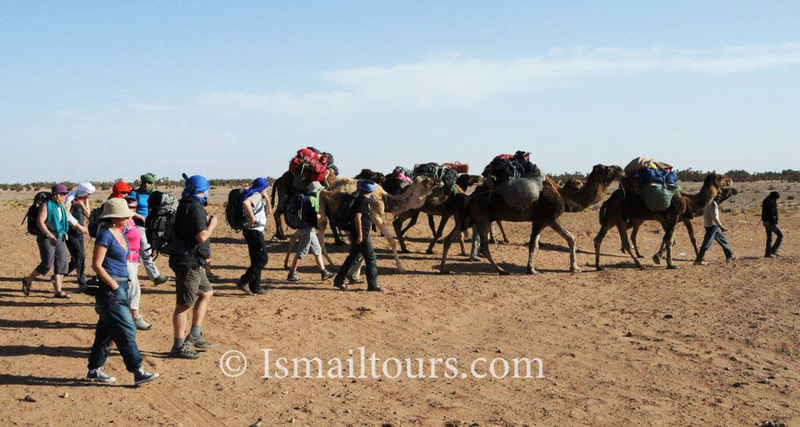 He has collaborated with travel agencies in the Netherlands and France and has founded his own agency “Ismail Tours”. He holds a first aid certificate and has completed an official education as a travel guide, at which he has also been a teacher. Ismail is a warm and vibrant person who aims to please his clients by making their voyages comfortable, informative and memorable. Dutch photographer Sabine Joosten is known for her documentary work with a personal style and intimate approach, which she honed over her more than 30-year career. Her photographs always reflect a personal touch, whether it is a private portrait commission or a commercial assignment. Her work spans the genres of social documentary reportage, travel and landscapes, daily life street work, as well as portraiture. She is a graduate of The Gerrit Rietveld Academy photography department. She is a passionate and engaging photography instructor and guide, who will teach you, starting with understanding camera techniques, how to see and interpret the visual clues that will enable you to make photographs with depth and character in a style unique to you. 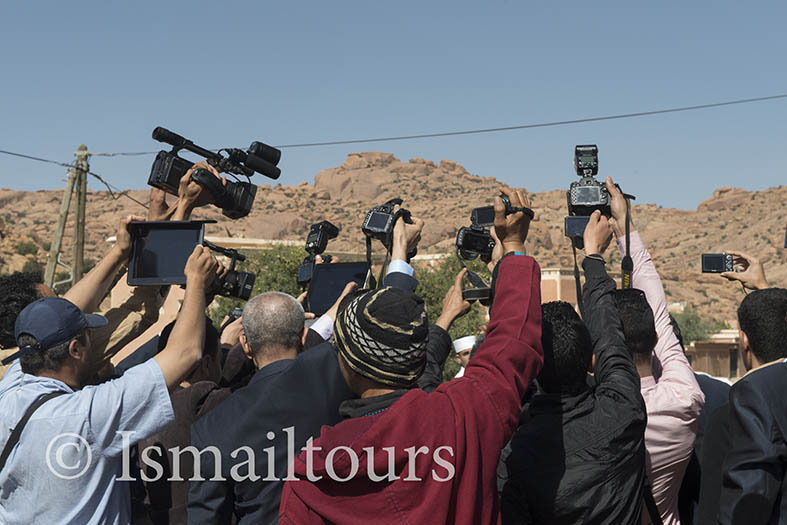 There will be a meeting in the middle of the country to look at each other’s work shot in Morocco to critique and discuss how to edit and sequence the work as complete story.